Here's the thing. I love body wash. At any given time, I have about 16 in my shower! And this week, I'll be bringing you some of my newfound favorites. Up today: Origins Gloomaway Grapefruit Body-Buffing Cleanser. Remember when I told you yesterday that I really don't like scrub cleansers? Well, there must be something in the water of my shower, because all of a sudden I'm in love with them. This one from Origins is even better than I could have dreamed! If you want a zesty kick to start your day off right, this is the body wash for you. It smells distinctly of grapefruit, which is no surprise since that's the foundation of the whole Gloomaway collection. It's sweet and citrusy, and it really brings a cheerful aspect to your shower routine. The exfoliating properties don't irritate the skin, but make it look and feel super soft and smooth. And a dime-sized amount is all that's needed for a rich, full lather. 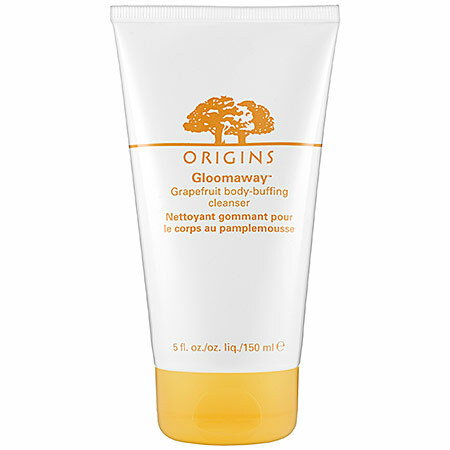 Origins Gloomaway Grapefruit Body-Buffing Cleanser retails for $22.50 at sephora.com.